​​​​​​​​​​​​​​​I started ROCK STAR PET SERVICE because, like you, I didn’t want to leave my dogs and cats with employees at boarding kennels or doggie daycare businesses, only to return to me sick or traumatized. I also didn’t want my dogs or cats confined to a cage for hours on end with little interaction, exercise, playtime or LOVE. I prefer to keep my pets at home in a secure, familiar environment where they can play with all of their toys, sleep in their beds, run in their yard and go for long walks every day with someone they know and trust. Over 30 years experience caring for pets, I was born an animal lover. I’ve had dogs all of my life and know how to raise well balanced, happy and socialized pets. Like many animal lovers, I couldn’t resist other cute critters. I’ve also had cats, birds, fish, turtles and other small animals, and rescued many wild critters. Of course, my first job at age 15 was at a pet store where I was responsible for the care and maintenance of countless puppies, kittens, small animals and reptiles. Later in life I began volunteering with St. Louis area rescue groups, fostering dogs waiting for forever homes. I still support pet rescues, which continuously inspires me to urge others to adopt and have their own pets spayed or neutered. 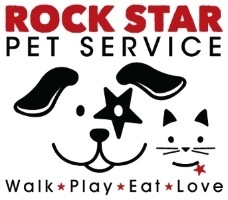 Thank you for considering ROCK STAR PET SERVICE! You finally have someone you can trust to take care of your furry family members. Fenton, Sunset Hills, High Ridge, Arnold. Ask about service in surrounding areas. Several pet care companies in the STL area are franchises. WE ARE NOT! Proudly owned and operated in Fenton, MO. Keep your business LOCAL! 8:30am – 11pm 7 Days a Week. Scheduling services in advance is preferred, however same day service can be accommodated depending on availability and area served. Ask about special accommodations. A $15 surcharge will be added to total bill on major holidays. Outside service area – $3-$5 mileage surcharge (per visit) will be added. Certified in Pet CPR and Pet First Aid through The Pet Professional Guild.